I have been playing for 7/8 years and have played all over the county looking for the best sites. I like both Woodland and CQB, but I LOVE IT when the 2 combine. I like my guns short but meaty looking, I'm currently using a fully licensed Arms Full Metal "Oberland Arms OA-15 M7" (moded AR15 by Oberland) and my trusy WE G18c Gen 4. Not only do I bring a myself to the forum, but I bring a new Skirmish site. Frontier Airsoft is a CQB Woodland site that is unlike any other site I have played at. A close frind of mine set this site up 18 months ago after working at other sites as a marshal. Since then we have ran a game every 2 weeks and we are getting busier and busier!! All our games are story based and many hours going in to making each game day unique and exciting. We don't just do the standard military games either (Blue Team V Red Team) Mexican Cartels, Mafia Families, Private security firms, it all happens at frontier. I think I remember seeing a debate about site rules on AI Magazine's Facebook page that had photos attached of Frontier Airsoft. Sounds like a good site with rules I can appreciate. I Can attest to what a great job Bill, Tom and the team do at Frontier. 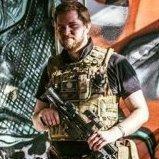 I always get made to feel welcome, the games are interesting with the storys always engaging with a nice mix of thier use of the woodland site and the CQB area. Chris and the other marshals are always friendly and aproachable, Chris even went as far as to shadow me for my first few games giving me advice as it was my first ever game and he wanted to make sure i was having fun.